The ABO system is regarded as the most important blood-group system in transfusion medicine because of severe hemolytic transfusion reactions and, to a lesser degree, hemolytic disease of the newborn. ABO grouping is a test performed to determine an individual's blood type. It is based on the premise that individuals have antigens on their red blood cells (RBCs) that correspond to the four main blood groups: A, B, O, and AB. Antibodies (isohemagglutinins) in an individual's plasma are directed against blood group antigens that their own RBCs lack (see Table 1, below). These antibodies (isohemagglutinins) form early in life. ABO antigens are expressed on RBCs, platelets, and endothelial cells and are present in body fluids. ABO testing is performed to prevent an adverse transfusion reaction that could be caused by ABO incompatibility between the blood of a patient (recipient) and that of a donor. RBCs = red blood cells. The precursor glycoprotein/glycolipoprotein that allows expression of all ABO antigens is composed of oligosaccharide chains with the essential addition of fructose. Alpha-2-L-fucosyltransferase is the enzyme responsible for adding fructose to the primary galactose of the oligosaccharide chain. This is the foundation "H" antigen. The gene for type "O" is silent and thus maintains the original formation of the H antigen. For the configuration of A, B, and AB antigens, an additional alpha 1,3-N acetylgalactosaminyltransferase and/or glycosyltransferase enzyme is encoded to attach additional sugars to the "H" antigen. For type A, an N-acetyl-galactosamine is attached to the primary, initial galactose. For type B, an additional galactose is attached to the primary galactose. For type AB, both of these sugars would be added (see Table 2, further below). 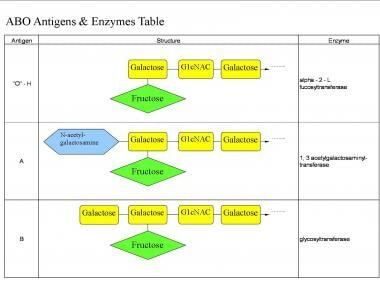 ABO antigens and enzymes table; G1cNAC = N-acetlygalactosamine. Image created by Jaye Parsley. The O allele is an autosomal-recessive trait, and the A and B alleles are codominant traits. Each parent contributes an A, B, or O allele to their offspring, depending on the ABO type of the parents (see Table 1, above). The frequency of ABO blood group antigens varies in different populations. Most people have the antigen "H" encoded, because this is the precursor for antigen A or B. Thus, depending on whether the other genes are encoded, it will then be determined if they will remain a type O or change to type A, B, or AB. Type O blood is the most frequent, and type B and AB are the least frequent (see Table 2, below). In rare cases, even the initial precursor H antigen is not genetically encoded. These individuals are known as Bombay and are able to receive only Bombay type blood, because they make antibodies to not only type A, B, or AB donor RBCs but also to type O donor red cells (anti-H), causing hemolysis of the transfused donor RBCs. The ABO test may be part of a group of tests performed in various clinical settings. A type and screen includes ABO, Rh, and antibody detection/identification. A type and screen of the recipient is performed to assess ABO compatibility between the recipient and potential donor of organ and hematopoietic stem cells. In hematopoietic stem cell transplantation, progenitor cells engraft into the recipient's chemotherapy-induced "empty" marrow and replace the recipient's blood ABO type and Rh type with that of the donor's if the engraftment is successful. A type and screen of the donor is completed as one of the required tests for blood donation. This allows blood-collection facilities to quickly assess the inventory status of ABO/Rh type by label identification. Before a donor unit is transfused, additional compatibility testing with the intended recipient's plasma/serum is completed. This will also act as a second validation step of the initial donor ABO/Rh typing. A type and screen of the donor is completed as one of the required tests for organ or hematopoietic stem cell donation to assess the level of compatibility of the donor's and intended recipient's ABO/Rh types, which will dictate the subsequent type of blood components transfused. Hemolytic disease of the fetus and newborn occurs when a fetus inherits paternal red blood cell (RBC) antigens that the maternal immune system does not recognize as her own. A small percentage of fetal blood may come into direct contact with maternal blood circulation through fetal maternal hemorrhage (eg, amniocentesis, trauma, miscarriage/abortion, placental abnormalities). The ABO system of fetal RBC antigens are not as fully developed in utero and are lesser in number. Mild hemolysis may result if there is ABO incompatibility between the baby and mother, as the maternal immune system does not easily recognize the incompatible ABO antigen, thus potentially averting a more serious hemolytic reaction. The scenario that is indicted more often for an increased severity of hemolysis is when the mother is type O and the fetus has either type A, B, or AB. The anti-A or anti-B antibodies that are produced from type O mothers are mainly immunoglobulin (Ig) G. IgG antibodies are smaller and are able to easily pass through the placenta, thurs more likely to expose fetal RBCs to the mother's antibody in the right clinical setting (see also Rh Incompatibility for information on hemolytic disease of the fetus and newborn) (Rh typing is discussed in a separate article). A platelet refractory evaluation attempts to evaluate why a patients platelet count did not increase as expected after a platelet transfusion; it includes evaluating immune-mediated versus nonimmune-mediated causes. ABO incompatibility is an example of an immune-mediated cause. Because ABO antigens are minimally expressed on platelets and less than 2 mL of RBCs are left in a unit of platelets, it is often unnecessary to give ABO-compatible platelets. However, if an individual requires frequent platelet transfusions, the amount of RBC exposure and platelet ABO antigens may increase enough that an individual's antibodies will attack and cause hemolysis. ABO typing is performed by taking a sample of blood, placing it in a centrifuge, and separating red blood cells (RBCs) from serum/plasma. A "front," or forward type, and "back," or reverse type, are then performed. The front/forward type takes an individual's RBCs and mixes them with commercially prepared reagents of anti-A antibody and with separate anti-B antibody. The test measures visual agglutination or lack of agglutination. The back/reverse type mixes an individual's plasma with reagent RBCs positive for antigen A, and separate reagent RBCs positive for B antigen. The test also measures visual agglutination or lack of agglutination. Most ABO antibodies are immunoglobulin (Ig) M. When IgM comes into contact with a foreign antigen, it attaches or "coats" the antigen. Once attached, IgM can come into contact with other antigen-binding sites and antibodies, which will bring them closer together, thus causing visual agglutination (see the following image). The presence of this reaction is designated with a positive symbol (+) and the absence with the number zero, as shown in Table 3, further down in this section. Manual Tube Testing. Image created by Jaye Parsley. ABO Grouping, common test reactions and interpretations. Image created by Jaye Parsley. The amount of sample can limit ABO typing. For standard tube testing, column agglutination "gel card" methodology (see the image below), and solid phase test systems, at least 1 mL of blood is required. Column agglutination, "gel card". Image created by Jaye Parsley. Factors that can cause interference of ABO testing include mixed field reactions and bacterial infections and malignancies. In a mixed field reaction, two different ABO groups are present in the same sample, causing discordant ABO typing. The front and back type results are not as predicted. Examples are discussed below. Massive transfusion of type O–negative RBCs to a non-O–type individual may cause a mixed field reaction or discordant ABO typing. The front and back type will not be concordant. Hematopoietic stem cell individuals may receive a transplant from a donor who has a different ABO type. Initial engraftment of the donor stem cells into the recipient's marrow may cause a mixed typing, because there are two different ABO types within the recipient until full engraftment occurs. ABO subtypes are defined as a blood type that has most of the chemical characteristics of type A, B, or O but that also has a slight variation in a portion of the structure that can be recognized through testing. These changes may occur through various mutations, such as frameshift mutations, amino acid substitutions, single point mutations, single missense mutations, and deletions. The amount of variation determines if it is clinically significant enough to cause hemolysis. Although uncommon, another discrepancy in ABO testing can result from certain bacterial infections and malignancies that may cause an acquired "B" typing from an A type individual. The patient's underlying disorder can cause enzymatic deacetylation of group A antigen, thus forming a B-like antigen, "acquired" B phenomenon. Although this will cause some weak discrepancies in the laboratory, the patient will still receive type A blood products. As noted earlier, the amount of sample can limit ABO typing. For standard tube testing, column agglutination "gel card" methodology (see the image below) and solid phase test systems, at least 1 mL of blood is required. If a newborn has received a substantial amount of type O red blood cells, the baby may be typed as O even if the baby is non-O. For many years, manual agglutination testing using a test tube was the main methodology for ABO/Rh typing. With the advent of automated testing, new methodology has been introduced, including column agglutination and solid phase test systems. Testing forward typing, an individual's red cells (in a 2%-5% saline suspension) are mixed in a test tube with separate reagents anti-A and anti-B at room temperature. After centrifugation, the pelleted cell button is gently resuspended and examined for agglutination. If there is agglutination, this will indicate a positive reaction. 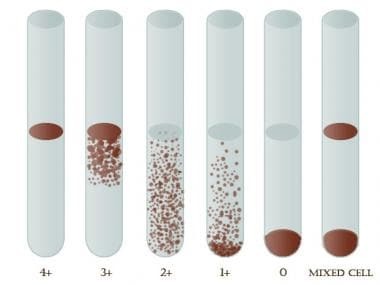 The amount of agglutination is graded on a scale of 0 to 4+, as shown in the following image. Testing back typing, an individual's plasma is mixed in a test tube with separate reagent A and B red blood cells (RBCs). The remainder of the testing and interpretation is completed as stated above for forward typing. Testing forward typing, an individual's RBCs are initially mixed at room temperature in small, gel-filled tubes that contain separate reagent anti-A and anti-B. The specimen is centrifuged and assessed for agglutination. 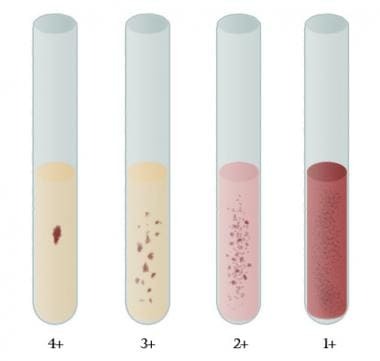 Agglutination seen at the top of the tube column indicates a strong positive reaction; agglutination seen at the bottom signifies no reaction. The amount of agglutination is also graded on a scale of 0 to 4+, as depicted in the image below. Testing back typing, an individual's plasma is initially mixed at room temperature in small, gel-filled tubes that contain separate reagent A and B RBCs. The remainder of the testing and interpretation is completed as stated above for forward typing. Separate anti-A and anti-B reagent is embedded in the bottom of microplate wells. An individual's RBCs (in a 2%-5% saline suspension) are mixed together with an enhancing reagent and centrifuged. The plates are then assessed. If there is just one tightly packed RBC pellet at the bottom of the microplate, this is considered to be no reaction. If there is a covering of RBCs throughout the bottom of the microplate, this would indicate agglutination, a positive reaction. As with the previous two tests, the amount of agglutination is graded on a scale of 0 to 4+. Testing back typing, separate portions of reagent A and B RBCs are embedded in the bottom of the microplate wells. An individual's plasma is mixed togeter with an enhancing reagent and centrifuged. The plates are interpretated as stated above for forward typing. The following table provides further description of conventional agglutination grading. Which is the role of genetics in ABO grouping? What are the indications for ABO grouping? What is the role of ABO grouping in transfusion recipient testing? What is the role of ABO grouping in recipient organ/hematopoietic stem cell testing? What is the role of ABO grouping in blood donor testing? What is the role of APO grouping in donor organ/hematopoietic stem cell testing? What is the role of ABO grouping in the evaluation of hemolytic disease of the fetus and newborn? What is the role of ABO grouping in platelet refractory evaluation? How do ABO subtypes cause mixed field reactions in ABO grouping? How is ABO grouping performed? What is a mixed field reaction in ABO grouping? How does a massive transfusion result in a mixed field reaction in ABO grouping? How does a mixed field reaction in ABO grouping occur following a hematopoietic stem cell transplantation? How do bacterial infections and malignancies cause mixed field reactions in ABO grouping? What are limitations of ABO grouping? What are the methods of ABO grouping? What is the role of manual tube testing in ABO grouping? What is the role of column agglutination in ABO grouping? What is the role of solid phase test systems in ABO grouping? What are lab resources for ABO grouping? Dean L, Pratt V, McLeod H, Rubinstein W, Dean L, Malheiro A. ABO blood group [updated 2015 Jul 27]. Blood Groups and Red Cell Antigens. 2012. [Medline]. Yamamoto F. Review: ABO blood group system--ABH oligosaccharide antigens, anti-A and anti-B, A and B glycosyltransferases, and ABO genes. Immunohematology. 2004. 20 (1):3-22. [Medline]. Jaff MS. Higher frequency of secretor phenotype in O blood group - its benefits in prevention and/or treatment of some diseases. Int J Nanomedicine. 2010 Nov 2. 5:901-5. [Medline]. Cooling L. ABO, H, and Lewis blood groups and structurally related antigens. In: Roback J, Combs MR, Grossman B, Hillyer C, eds. Technical Manual of the American Association of Blood Banks. 16th ed. Bethesda, MD: AABB Press; 2008. 361-77. Mujahid A, Dickert FL. Blood group typing: from classical strategies to the application of synthetic antibodies generated by molecular imprinting. Sensors (Basel). 2015 Dec 31. 16 (1):[Medline]. Chaurasia R, Rout D, Dogra K, Coshic P, Chatterjee K. Discrepancy in blood grouping: subgroups of B-challenges and dilemma. Indian J Hematol Blood Transfus. 2017 Dec. 33 (4):628-9. [Medline]. Marsh WL. Scoring of hemagglutination reactions. Transfusion. 1972 Sep-Oct. 12 (5):352-3. [Medline]. Beadling WV, Cooling L, Henry JB. Immunohematology. In: Henry JB, ed. Clinical Diagnosis and Management by Laboratory Methods. 20th ed. Philadelphia, PA: WB Saunders; 2001. 660-717. Daniels G, Bromilow I. The ABO blood groups. Essential Guide to Blood Groups. Malden, MA: Blackwell Publishing; 2007. 20-8. Klein HG, Anstee DJ. ABO, Lewis, and P groups and Ii antigens. Mollison's Blood Transfusion in Clinical Medicine. 11th ed. Malden, MA: Wiley-Blackwell; 2005. 114-62. Pierce BA. Ch 5: Extensions and modifications of basic principles. Genetics: A Conceptual Approach. 3rd ed. New York, NY: WH Freeman & Company; 2008. 108-10. Transfusion-service-related activities. Klein H, Ilstrup S, Kleinman S, et al, eds. Standards for Blood Bank and Transfusion Services: 50th Anniversary Edition. 25th ed. Bethesda, MD: American Association of Blood Banks; 2008. 37-48. Glisch C, Jawa Z, Brener A, et al. Evaluation of a two-sample process for prevention of ABO mistransfusions in a high volume academic hospital. BMJ Open Qual. 2018. 7 (3):e000270. [Medline]. Uno S, Tanaka T, Ashiba H, et al. Sensitive typing of reverse ABO blood groups with a waveguide-mode sensor. J Biosci Bioeng. 2018 Jul. 126 (1):131-7. [Medline]. Lane WJ, Westhoff CM, Gleadall NS, et al, for the MedSeq Project. Automated typing of red blood cell and platelet antigens: a whole-genome sequencing study. Lancet Haematol. 2018 Jun. 5 (6):e241-51. [Medline]. Chen DP, Wen YH, Lu JJ, Tseng CP, Wang WT. Rapid rare ABO blood typing using a single PCR based on a multiplex SNaPshot reaction. J Formos Med Assoc. 2018 Jun 30. [Medline]. Bub CB. Dithiothreitol treatment of red blood cells. Immunohematology. 2017 Dec. 33 (4):170-2. [Medline]. Kang BH, Choi D, Cho J, et al. Efficacy of uncross-matched type O packed red blood cell transfusion to traumatic shock patients: a propensity score match study. J Korean Med Sci. 2017 Dec. 32 (12):2058-63. [Medline]. Jiang E, Yu P, Zhang S, et al. Establishment of an alternative efficiently genotyping strategy for human ABO gene. Leg Med (Tokyo). 2017 Nov. 29:72-6. [Medline]. Davenport ER, Goodrich JK, Bell JT, Spector TD, Ley RE, Clark AG. ABO antigen and secretor statuses are not associated with gut microbiota composition in 1,500 twins. BMC Genomics. 2016 Nov 21. 17 (1):941. [Medline]. Stack G, Tormey CA. Detection rate of blood group alloimmunization based on real-world testing practices and kinetics of antibody induction and evanescence. Transfusion. 2016 Nov. 56 (11):2662-7. [Medline]. Jeyakanthan M, Tao K, Zou L, et al. Chemical basis for qualitative and quantitative differences between ABO blood groups and subgroups: implications for organ transplantation. Am J Transplant. 2015 Oct. 15 (10):2602-15. [Medline]. Fichou Y, Audrezet MP, Gueguen P, Le Marechal C, Ferec C. Next-generation sequencing is a credible strategy for blood group genotyping. Br J Haematol. 2014 Nov. 167 (4):554-62. [Medline]. Hara A, Imamura A, Ando H, Ishida H, Kiso M. A new chemical approach to human ABO histo-blood group type 2 antigens. Molecules. 2013 Dec 31. 19 (1):414-37. [Medline]. Huh JY, Park G, Jang SJ, Moon DS, Park YJ. A rapid long PCR-direct sequencing analysis for ABO genotyping. Ann Clin Lab Sci. 2011 Fall. 41 (4):340-5. [Medline]. Special thanks to Jaye Parsley for providing the digital images/diagrams for the various methods utilized for ABO testing.